Newsletter 050: There is no more room here! There is no more room here! So next May 23rd, 24th and 25th all our warehouse staff will be enlarging it and reorganizing all our current stock, and they won't be able to package your shipments. 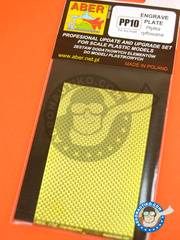 However, our website will still be fully operative, and so will our customer service. You will be able to place your orders as usual, only that you'll have to take into account that they won't be shipped until May 26th. 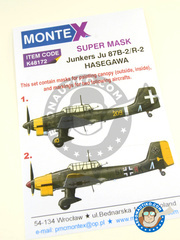 Masks set for decorating the Stuka according to two different schemes operating at the Balkan mountains in 1941. The first one reproduces an Italian unit, while the second one reproduces a German unit. 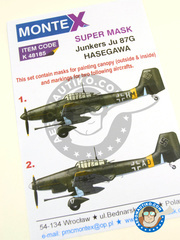 Vinyl mask for decorating JunkersJu-87 Stuka with two possible versions belonging to Luftwaffe SG2. An absolutely enormous box for an absolutely enormous scale model: just the turbine detailing has enough material for writing a whole book. 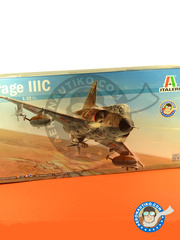 Add to that two huge Cartograf printed decal sheets for 6 different decorations, the plastic parts detailing, the wealth of the parts break up, and the photoetched parts sheet, the result is a kit you will definitely make you fall in love with! 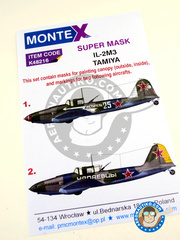 Set of masks for recreating two different decorations on Tamiya 1/48 scale Ilyushin IL-2 Shturmovik. The first one belongs to the unit operating during spring 1945 at the 198th ShAP, while the other belong to a unit operating in spring 1945 at an unknown squadron. 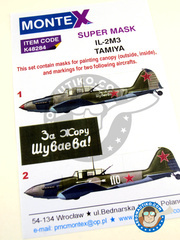 Set of masks and decals for recreating two different decorations on Hobby Boss Ilyushin IL-2M Shturmovik: the first one operating over the Baltic Sea in 1944, and the second one doing it over the Leningrad front. This envelope hides two very interesting decorations for the Ilyushin IL-2M3 Shturmovik. One of them is located in the Polish Air Force during summer 1945, and the other is guessed to belong to the 233 ShAD during 1944-1945 winter. 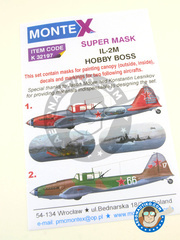 Set of masks for recreating two decorations of two units operating at Russia in 1944. 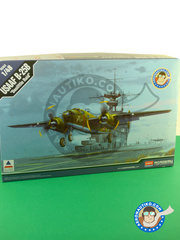 North American B-25 Mitchell versión B scale model kit just like it was used during "Doolittle Raid" by Col. Doolittle. 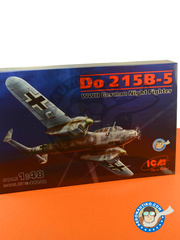 The kit includes fully detailed cockpit, panels and bomb bay, as well as exterior panels and rivet lines. 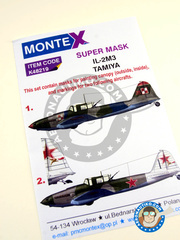 The decals sheet will allow you to reproduce 6 different versions: plane #11, 02249 "Hari Kari-er", plane #15, 02267 "TNT", plane #7, 02261 "Ruptured Duck", plane #3, 02270, "Whiskey Pete", plane #9, 02303 "Whiring Dervish". 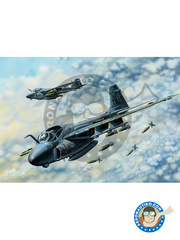 Huge and very complete kit of the Panavia Tornado IDS, including an excellent "offset" printed decals sheet for decorating the plane exactly like Luftwaffe did for commemorating the FBW 33 50th anniversary ("50 Jahre JaBoG 33") in 2008. 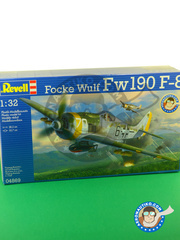 A new issue of the Focke-Wulf Fw 190 Würger in 1/32 scale by Revell, including detailed engine, operational engine covers, an elevated plinth, and decals for reproducing two units operating in 1945 over Czech Republic skies. 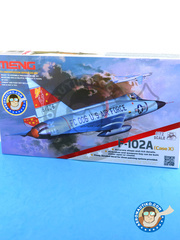 A nice scale model kit of the quite unusual Convair F-102 Delta Dagger, including operative airbrakes among many other details, and three decal decorations based in units operating during 1958, 1962 and 1970. 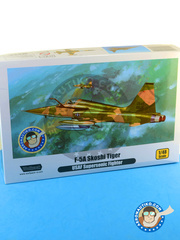 Here is the Northrop F-5F-5A Skoshi Tiger scale model belonging to WolfPack "Premium Edition Kit" series, including resin made ejection seat and fuel nozzle made by stereolithography, in addition to plastic parts, photoetched parts and masks. A totally luxurious kit. 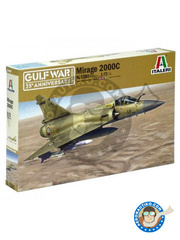 Kit includes 520 parts, a fully detailed cockpit, and also include metal and photoetched parts. 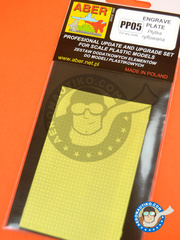 Photoetched grid with square pattern, measuring 80x45 mm (grid) and 1,0x1,0mm (pattern). 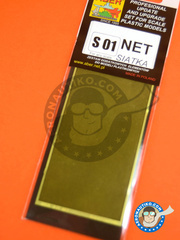 Photoetched plate with anti-slip pattern, measuring 90 x 60 mm. 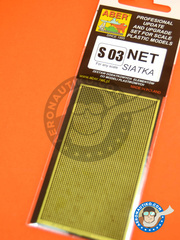 Photoetched grid with square pattern, measuring 80x45 mm (grid) and 0.5x0.5mm (pattern). 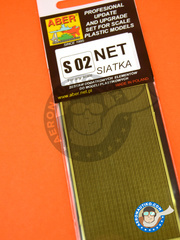 Photoetched grid with square pattern, measuring 80x45 mm (grid) and 0.7x0.7mm (pattern). 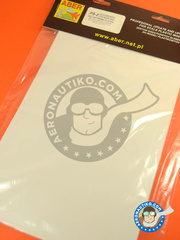 Set of 4 sheets of white polystyrene measuring 195x315 mm and 0.25 mm thick, ideal for making transformations and scratch parts. 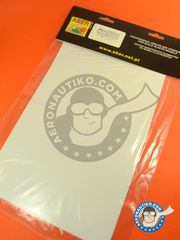 Set of 4 sheets of white polystyrene measuring 195x315 mm and 0.50 mm thick, perfect for making transformations and scratch parts. 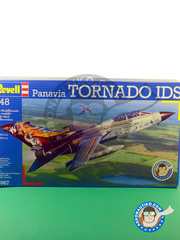 An enormous and very exhaustive kit of the Panavia Tornado including a whole detailed cockpit, exhaust nozzles break up, variable geometry wings , an extensive armament, and a grand total of 280 parts that will make you have a really great time! 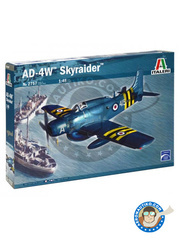 It has been a while since we had such an interesting airplane scale model... at such a low price!!! 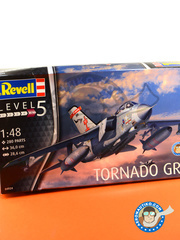 The kit includes both detailed engines, all crew compartments, landing gear, ... and in addition, panels are perfectly carved and invites to be painted with all your scale modeler love.